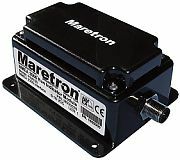 Maretron?s Run Indicator Module monitors both AC and DC electrical circuits and reports, over an NMEA 2000® network, whether or not the electrical circuit is energized and running. The RIM100 works equally as well for monitoring manually switched loads (e.g., running lights, anchor lights, or deck lights) as it does for automatically switched loads. Monitoring automatically switched loads (e.g., bilge pumps, engine exhaust/intake fans, and transfer pumps) via the RIM100 is especially useful because you know exactly when equipment is, or isn't running. Best of all, the RIM100 is NMEA 2000® certified so you can view any and all run indicator status anywhere on the vessel using a compatible NMEA 2000® display. The RIM100 is a key component of Maretron's N2KView® vessel monitoring and control system.